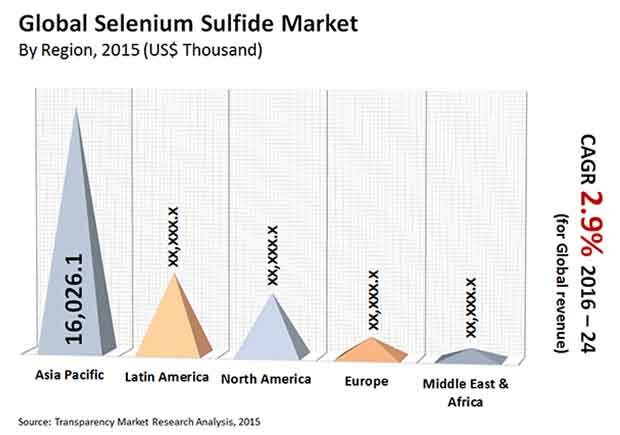 The global selenium sulfide market had witnessed the dominance of top four players accounting for a sweeping share in the recent past. These players, viz. Fagron, Wockhardt, Alfa Aesar, and abcr GmbH have been anticipated in a report by Transparency Market Research (TMR) to focus on Asia Pacific and the Middle East to expand their share and presence in the market. According to TMR analysts, players could also focus on mergers and acquisitions to increase their growth in the coming years. For instance, AnazaoHealth had been acquired by Fagron with a view to fortify the latter’s position using an enhanced supply chain network and a large customer base. TMR has prognosticated the global selenium sulfide market to post a moderate CAGR of 2.9% for the forecast tenure 2016-2024. By the concluding forecast year, the market could collect revenue worth a US$35.6 mn. As per the product analysis of the market research firm, selenium sulfide with a 99.99% level of purity has been projected to chalk up a 15.4% CAGR that could be higher than of other products available on the market. By region, Asia Pacific could be at the helm of the market considering its more than 57.0% share achieved in 2016. The growth of the world selenium sulfide market has been predicted to ride on the swelling demand for specialized hair care offerings, particularly in emerging countries. As per a TMR analyst, anti-dandruff and hydrating shampoos have been gaining a massive demand from consumers in China, India, the Philippines, Malaysia, Thailand, Argentina, Mexico, and Brazil. Improving disposable income in these economies has been forecast to be a driving factor pushing the demand for a variety of personal care and grooming products. The author of the report has stated that the world selenium sulfide market could gain from the expanding cosmetics and personal care industry as a result of the surge in income of consumers that is impacting their lifestyle. Analysts envisage carcinogenic properties of selenium sulfide to be one of the significant growth deterrents of the global market. Several governmental bodies have imposed restrictions on the usage of selenium sulfide in cosmetics and personal care products. However, developing economies such as Asia Pacific could offer rewarding prospects on the back of the rising usage of veterinary medicines and magnifying awareness about veterinary care. Change in buying preferences of consumers owing to their improved lifestyle and income could be another factor bringing back the demand for selenium sulfide.